"Can I use LeadPages with Squarespace?" "Can I host webinars with Squarespace?" "Can I optimize my SEO with Squarespace?" So I've compiled the 7 questions I get asked the most and answered them all here! 1. "Can I use LeadPages with Squarespace?" Yes, you can use LeadPages with Squarespace. Just because LeadPages doesn't show the Squarespace logo everywhere, doesn't mean it isn't compatible. The only feature of LeadPages that you "lose" with Squarespace is hosting the landing page on your own website. But research shows that having the landing page hosted on LeadPages, won't hurt your conversions. And by hosting the pages on the LeadPages' server, you never have to worry about site speed again for your landing pages! Integrating LeadPages and Squarespace couldn't be easier. Just put a link on your website to the LeadPages URL if its a landing page. If you're using a LeadBox, you can link that with text, buttons, or graphics! 2. "Can I have an opt-in in my header on Squarespace?" Yes, you can have an opt-in in your header (or anywhere you want!) on Squarespace. It is a well-known marketing strategy that you should have a newsletter opt-in "above the fold" on your website. And while none of Squarespace's templates show you this by default, it is easy to do with many different templates. Due to Squarespace's drag-and-drop functionality, you can add a Form, Newsletter Block, or Button to almost any part of a website. A template like Bedford is great for adding a button in the navigation bar. And a template like Pacific lets you create highly customized pages where you can add any block you want to any section of the page. 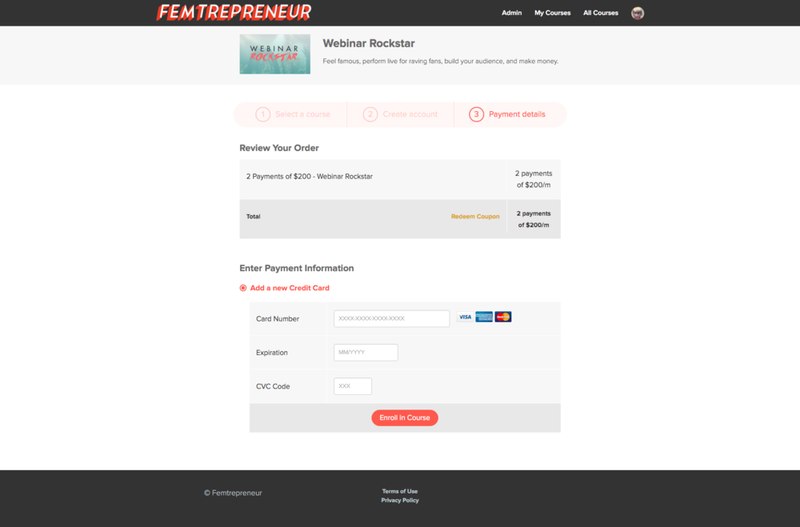 Example: Femtrepreneur.co has an opt-in in the navigation bar and in the header. 3. "Can I have private pages on Squarespace?" Yes, you can restrict access to pages on Squarespace by either adding a password or disabling the page. 1. Adding a password to your page (allows visitors to access if they have the password). If you want to allow visitors to access the page if they have the right password, then I recommend setting up a password for the page. Click the Settings icon next to the Page and scroll down to the Password section that is currently empty. Enter in the password you want to use, Save, and you now have a password protected page. Tip: Don’t forget to customize what your password protected pages look like! In your website Settings panel, click Design, Lock Screen, and customize! You can only set one lock screen style at this time, so if you have multiple password-protected pages on your website, make sure this lock screen is neutral enough to apply to all of them. 2. Disabling the page (Prevents visitors from viewing the page and redirects them to an error page). If you don’t want anyone but you to see the page, then I recommend disabling. Click the Settings icon next to the Page and uncheck Enabled. Voila! You know have a page that only you can see. Tip: Customize your 404 / Error page! Create a new page on your website that you want visitors to see when they go to a broken link. Add a search bar, an opt-in, or anything you want to take advantage of the situation and help them out. Go to your Settings panel, under the Website section click Advanced, click 404 Error / Page Not Found, and select what Page you want to redirect them to. You can view mine here! Yes, you can use Teachable with Squarespace! Teachable is a great platform where you can sell online courses or subscriptions and I highly recommend it! But if you already have a website, it can be confusing to know how to integrate it with your Squarespace site. There are two general approaches on how to do this and they are both great! You can even use a combination of them. 1. Create a sales page on your website for your course and link the “Buy Now” button to the Teachable sales page or checkout page. If you want your course to have a custom sales page, then you’ll want to just change the “Buy Now” button link to your Teachable site. I’d recommend sending them directly to the sales page for the course on Teachable or the direct checkout link. If you have multiple payment options, I suggest the sales page. That way they can see their payment options, choose the payment option they want, and then enter the checkout process. If you only have one payment option, feel free to bypass the sales page and link them to the checkout page directly! Example: Webinar Rockstar has its own website with the primary sales page. When you click the Register Now button, you're taken to the Teachable page to checkout. 2. Link directly from your website to your Teachable site to show your courses. In this option, you’re not creating any additional sales pages. You’ll put a link in your navigation bar that says “Shop” or “Courses” or something to that extent and just direct them to your Teachable page where they can view all of your products and sales pages there. Example: The Nectar Collective has "Courses" in the navigation bar. When you click it it takes you to the course site. Yes, you can host your own webinars on Squarespace! You’ll just need a few things. If you’re going to start doing webinars, the technology may be the most overwhelming piece of the puzzle. But you don’t have to start using any fancy webinar software to start! I recommend using Cover Pages for your Registration and Thank You pages. You can see examples of both on my recent blog post, 8 Different Ways to Use Squarespace Cover Pages. Connect the Form on the Registration page to your email marketing platform and make sure it is easy for you to track that they registered. As far as the live page goes, just create a new page on your website and drop in the embed code for a Google Hangout and a chat roll. Yes, you can use ConvertKit with Squarespace! While Squarespace only has a direct integration with MailChimp (boo!) you can still add ConvertKit to your Squarespace site in a few different ways! 1. Embed the ConvertKit opt-in. Go into your Form on ConvertKit, click Settings, then Embed. Copy the raw HTML section. Then go to the page on your website where you want to drop in the opt-in and add a Code block. Then paste the HTML you copied and save! Easy! 2. Using Squarespace Forms, Google Sheets, and Zapier. 3. Use LeadBoxes from LeadPages. If you have LeadPages already, then using LeadBoxes is a great way to add ConvertKit opt-ins to your site! I’m hoping that Squarespace will add in a direct integration with ConvertKit soon! If you want to learn more about ConvertKit, read why I switched to their system and why I love it! Yes, you can optimize your SEO with Squarespace! Some business owners spend hours and hours worrying about their site’s SEO or Search Engine Optimization. While SEO is important if you want to show up in search results, I don’t feel it is something you need to dedicate copious amounts of time towards. And that’s why I love Squarespace. Squarespace is designed from the ground up to be optimized for you, so you don’t have to worry about it! Sound like a lot? Not sure how to do it with Squarespace? If you want to learn more about how to optimize your Squarespace website for SEO, check out this post by Zack from Web Focused. And, of course, the pros at Squarespace also have a comprehensive article already there to guide you through each of this! Learn how to increase your site’s visibility to search engines here. They have an entire section on SEO and Metrics that you should read.